Doctors directed to end their strike within the next 24hrs as directed by the court. - Bana Kenya News, Real African Network Tubanane. 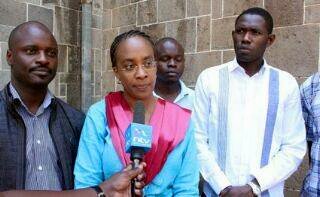 Home Nairobi Doctors directed to end their strike within the next 24hrs as directed by the court. Doctors directed to end their strike within the next 24hrs as directed by the court. The doctors have been given 24hrs to negotiate with the religious leaders and other related organisations who were at the negotiation table to provide a durable solution to the stalemate. Already some doctors went back to work and are supervised by their respective counties. According to the KMA chairperson Dr Jacqueline Kitulu, the doctors are engaging the partners in good faith, some leaders are busy sabotaging the talks while the government is working hard to intimidate the process as well. The doctors are expected to get a return to work formula signed by the government officials which will lead them to go back to work. The KMPDU leaders told their members to remain united and their jobs are fully secured. The majority Adan Duale said that the government will review the functions of unions in Kenya. He said that Unions have misled its members and now they are used as a campaign tool. In Some counties, their doctors are back to work because the respective governors have dealt with it. Some counties decided to pay their doctors in waiting for the National government to complete the negotiations. The doctors have vowed to return to work if there will be a return to work formula and signed by the government and the Governors.